US Secretary of State John Kerry on Monday signaled his determination to launch a new Middle East peace bid in the coming days, warning the time to get a two state solution is drawing to a close. But he offered few details of how new peace talks might avoid the pitfalls that have led earlier efforts to collapse. “What happens in the coming days will dictate what happens in the coming decades,” Kerry told a Washington conference of the American Jewish Committee (AJC) Monday, as the State Department said that Kerry planned to make his fifth trip as Secretary to Israel, Ramallah and Jordan next week. 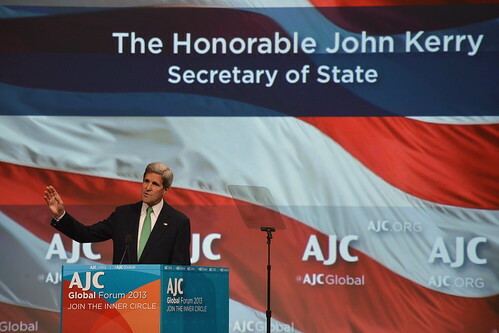 Kerry, in his first major speech to a US Jewish audience since becoming Secretary of State, called Israeli Prime Minister Benjamin Netanyahu and Palestinian Authority President Mahmoud Abbas peace partners, who shared his commitment to reach a negotiated two state solution. While saying he understands why many in the region are skeptical the time is right to achieve a permanent Israeli-Palestinian peace accord, Kerry warned of the consequences of delay. Many plugged-in US peace process veterans said they had little understanding of the details of Kerry’s initiative, while some Israeli observers expressed wariness that a fragile new peace effort, without the proper ground-work, was liable to collapse, potentially leading to violence. The Israeli leadership wants peace, but “may be split between those who don’t believe the other side can deliver, and those who in addition are not yet ready [or] willing to put on the table what they know they’re going to do one day,” one Israeli official, speaking not for attribution, said Sunday. “My guess is [Kerry] has no illusions about Netanyahu, and he knows President [Obama] will not expend heavy duty capital to rein him in,” one veteran Israeli peace activist, speaking not for attribution, told Al-Monitor Monday.